​An unforgettable interactive experience with dolphins , a unique Bali dolphin (Dolphin Lodge Bali) discovery experience, delight the hands-on and personal contact program with these wonderful and friendly dolphins in Bali. Be part of an unforgettable interactive experience with dolphins. The Bali Dolphin (Dolphin Lodge Bali) is located on a floating sea pen in Bali ocean. These friendly dolphins will amaze you with their intelligence, physical ability and gentleness. 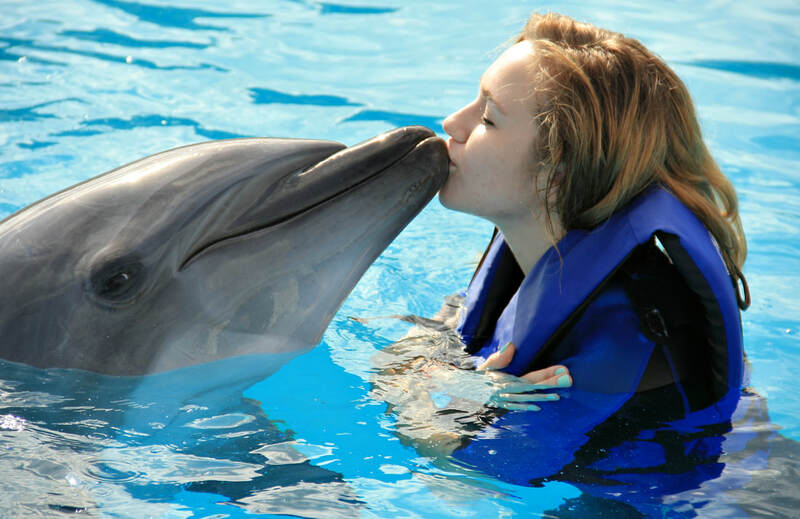 You'll spend 30 minutes in our specially designed dolphin enclosure, where you'll have the chance to experience the thrill of up-close and personal contact through petting, hugging, kissing and playing with dolphins! The close contact sessions in Bali Dolphin (Dolphin Lodge) are probably one of the best experiences you will ever have in Bali holiday. Since group sizes are limited and kept to minimum to ensure quality time with the dolphins, it is essential to pre-book your place well in advance. 2. There are some area in Jimbaran and Seminyak that not covered by our free pickup program, alternatively you can wait at our pickup point that nearest of your hotel. ​5. Special order of transport service for area out of our transport service, can be arrange subjected to availability of transport and charges different depending locality of request. Due to heavy request on swim with dolphin - it is essential to plan well ahead and BOOK well in advance if you want to book a dolphin interact. Adults and children with history of epilepsy or similar illnesses, children under the age of 5 years or below the minimum height of 1.35m and women who are pregnant or suspected to be pregnant are prohibited in the water with the dolphins. Depending on the weather conditions of the day, sea conditions can result in clients becoming seasick while out at sea. Cancellations of tours can occur with very little warning. Bali Dolphin / Dolphin Lodge Bali operates daily with three programs. Each duration approximately three to three and a half hours and a complete guided commentary is given throughout the tour. Bali Dolphin / Dolphin Lodge Bali restricts the number of dolphin swimmers allowed in the water maximum 5 visitors with one dolphin. Bali Dolphin / Dolphin watching does not have the same capacity restrictions as interacting and is not under the same demands as dolphin interacting. There is however a restrictions to participate as both a swimmer or a watcher to a maximum of 15 passengers per boat. Both Dolphin Bali Lodge programs, interacting and watching utilize the same boat. Bali Dolphin / Dolphin Lodge Bali boats are fitted with hot deck showers and toilets for passenger comfort and have covered areas for protection against the weather elements. Things to bring on the tour are a swimsuit and towel ( if swimming ), warm clothing and camera. Dolphins will make you tingle with excitement! It is our ambition to promote a better awareness of dolphins and their intricate underwater world. In order to do this, we have specifically developed our Dolphin Encounter programs in Bali, through the educational and interaction portions of this experience, so you will gain a deeper understanding of dolphins and enjoy a special closeness with dolphins. These friendly dolphins in Bali will amaze you with their intelligence, physical ability and gentleness. You'll spend around 30 minutes in our specially designed dolphin enclosure, where you'll have the chance to experience the thrill of up-close and personal contact through petting, hugging, kissing and playing with dolphins! The close contact sessions are probably one of the best experiences you will ever have.